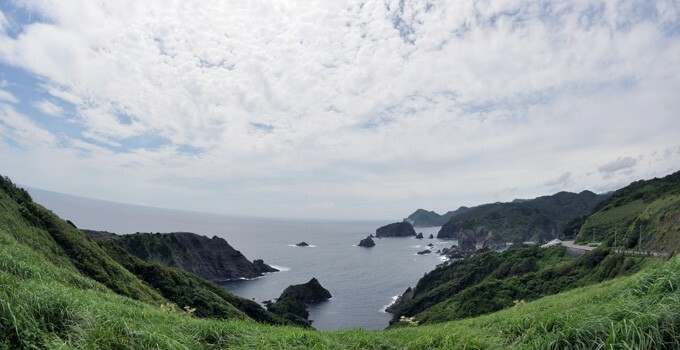 Since the coastlines around Irozaki were formed in a process where ash and lava from submarine volcanoes were slowly eroded by wave action over a long time, the area is full of precipitous landscapes. A notable point of the geosite is the expanse of a gently-sloping hill in a small plateau called ‘Ikenohara’, and the Yuusuge Park with day lilies. This gently-sloping hill was created by the Minamizaki Volcano, which erupted about 400,000 years ago. A good view of this area can be seen from the sightseeeing boats that leave from Irozaki. You can see that on top of white rocks (products of submarine volcanoes) there are layers of gray lava and reddish brown scoria (ejected from the Minamizaki Volcano). From the parking lot is a 3-minute walk.